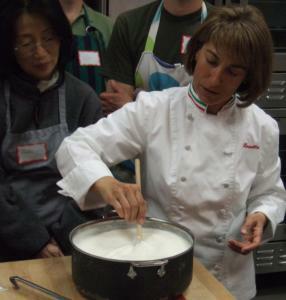 EMERYVILLE, Calif. - “My father would not approve,’’ says Rosetta Constantino during her class on fresh ricotta. In the village of Verbicaro, Calabria - the toe of Italy’s boot - where Constantino lived until she was 14, ricotta was made with milk from the goats or sheep each family owned. In California, where such milk is not easy to find, she has Americanized the traditional method. In well under an hour, she transforms a gallon of store-bought cow’s milk, along with a lesser amount of cream, salt, and rennet, which helps form the curds, into a pillow-soft topping for bruschetta and a comforting filling for oversize ravioli, chocolate cannoli, and other treats. After earning a degree in chemical engineering and working in Silicon Valley, Constantino, 48, wanted a change and decided to try her hand at teaching the unpretentious foods of her girlhood. She rents a well-equipped professional kitchen in Emeryville and also teaches at Ramekins Sonoma Valley Culinary School. Most classes cost $85 and include a meal. To re-create her hometown ricotta recipe, for example, Constantino measured ingredients and timed her mother as she made it. “She’d stick her finger in the pot and say it was ready and I’d grab a digital thermometer,’’ she says. “She never needed a thermometer.’’ On a recent Saturday night, her mother, Maria Dito, was on hand to help Constantino teach a three-hour ricotta session, followed by using it in a meal from appetizer to dessert. Ricotta-making, while not difficult, takes some care, especially in the initial heating and cooling phase. Dito, who is supervising this process without the aid of a clock, offers 10-, five-, and two-minute warnings in both Italian and English that the simmering milk mixture is nearly ready for the next step. With a bit of patience and practice, a gallon of milk will yield enough curd to make a satisfying quart of ricotta. Students look on eagerly as mother and daughter take turns coaxing the whey until it coagulates. When the ricotta is drained, packed, and firm, the class gets to work quickly, using it in dishes. To start, fresh ricotta is a sublime topping for traditional bruschetta, hearty bread slices brushed with olive oil, baked, and rubbed with garlic. A slow-roasted tomato wedge or fresh herbs make a nice addition, but are hardly necessary with ricotta this fresh and smooth. The cheese also stars as the primary ingredient in Calibrese-style ravioli. Made from a rustic flour-and-water pasta, oversize ravioloni, hot from the pan, are topped with grated cheese and fresh tomato sauce. The main course, a simple asparagus frittata and side dish of stuffed white zucchini, taste new with the ricotta. The dessert cannoli is served the way Constantino’s husband’s Sicilian family does it: with chocolate shells and a ricotta filling studded with chocolate chips and topped with a strip of candied orange peel. At mealtime, Constantino’s husband and son join the group, helping ensure there are no leftovers and clearing plates from the tables. Her father may have preferred his ricotta made from goat’s milk, but he surely would have approved of this family affair: teaching, cooking, and eating together, the Calabrian way. A schedule of Rosetta Constantino’s classes and details on her culinary tour of Calabria this fall are at www.cookingwithrosetta.com.